The bleak, lunar like Uyuni salt flats in Bolivia are the focus of the one of the most intriguing examples of Chinese engagement with Latin America. Beijing recently signed an agreement with La Paz to build a $2.9 million lithium processing plant; a pilot project, which if successful could be expanded and make the country the world’s leading supplier of the metal. The Uyuni region contains one of the world’s largest reserves of lithium, a silver white metal which is the lightest in the periodic table, highly unstable, it is often remembered as fizzing across water in a chemistry class. Lithium is a key component in cars, computers and phones, which are all made in huge numbers in the factories of China. Bolivia had been keen to develop its own indigenous lithium industry, but it appears a lack of technical knowledge has pushed them towards receiving assistance from China. Bolivia like many other countries has seen its natural resource wealth benefit its elite, rather than the majority of its population, and the Morales’ government has understandably tried to ensure there is “value added” to the lithium production so it is not merely extraction. The Bolivian government also spoke with Japanese companies, as well as others from around the world regarding the project, but many firms are concerned about working in the country after the Morale’s administration nationalised other industries. In contrast Chinese companies appear to be comfortable working in state led economies, already being highly active in Venezuela and Ecuador. 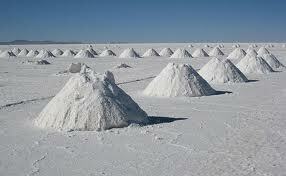 Chile and Argentina already have established lithium industries and because of the difficulties of extraction there is no guarantee that Bolivia’s superior reserves will translate into a sustainable industry, so the jury is out on whether the industry will be a success. Another Sino-Bolivian connection is the Chinese built Tupac Katari satellite, which is currently being tested before being launched into space. Named after an indigenous hero that expelled the Spanish from the country for a short while before it was finally reconquered. The satellite will help Bolivia improve its communications as well as detect natural resources across the country. The project is also an indication of the strong ties between the left-leaning and anti-American Morales and its new ally Beijing. It is interesting to note this pattern is repeated across Latin America, with left leaning governments like Ecuador, Venezuela and Argentina all borrowing funds from and allying themselves more and more with China, while economies percieved as more free market such as Colombia and Chile remain politically closer to the US. Although nearly all countries in the region have developed strong trade links with China. This scenario begs the question, could Latin America split politically, between states favouring China, and those the US? Next Next post: Coups, oil and a resurgent West: The Future of China – Africa Relations?